Donald J. Trump has been president of the United States for 100 days. During that time, he has failed to deliver on the promises he made to the American people. On important items like healthcare, staffing his administration, the budget, and tax reform he’s proven time and time again that he and his administration serve special interests and not the American people. His regressive policies have not improved the lives of working Americans – in fact, his decisions have made things worse. On healthcare, Mr. Trump promised it would be “far less expensive”. He promised that his plan would provide “insurance for everybody” and would increase the quality of care. The exact opposite is true. TrumpCare would result in 24 million more uninsured Americans. Out-of-pocket costs including premiums, deductibles, and copays would increase significantly under TrumpCare. On serving special interests instead of the American people, Mr. Trump promised to “drain the swamp.” In fact, in his first 100 days, he has again done exactly the opposite. He has filled his administration with Washington insiders, issued waivers to sidestep his five year lobbying ban, and continues to refuse to release the White House visitors’ logs. The American people deserve to know with whom the president and his administration are conducting business, but Mr. Trump clearly disagrees. On the budget, Mr. Trump promised to make life better for all Americans. But his budget blueprint proves just the opposite. Mr. Trump’s budget seeks to slash funding for lifesaving medical research, zero out funding to help low income families secure affordable housing, and even eviscerates the Meals on Wheels program on which tens of thousands of North Carolina seniors depend. Building on his record of broken promises and working for special interests, it’s no surprise Mr. Trump’s tax plan would hurt working families and disproportionately benefit the wealthy and large corporations at the expense of middle class Americans. We cannot afford a tax plan that hands multi-billion dollar tax breaks to the super rich while middle class Americans are forced to shoulder the burden of paying for it. North Carolinians and the American people deserve a government that will work to support everyone – not just the special interests and those at the top. We deserve and demand nothing less. 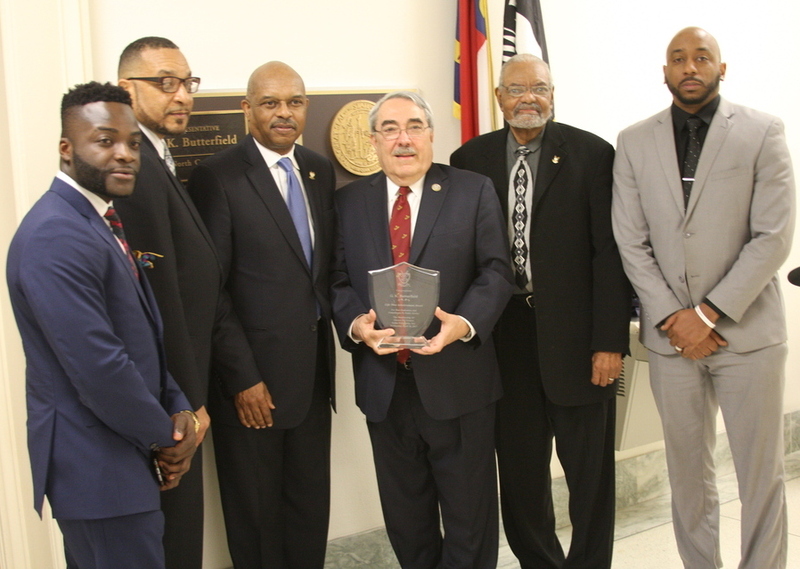 Congressman Butterfield receiving an honorary award from North Carolina’s Groove Phi Groove Fraternity. Congressman Butterfield meeting with members of North Carolina Electric CoOps. Congressman Butterfield met with Dr. Michelle Ogle of the Warren-Vance Community Health Center to discuss the importance of supporting treatment and primary care for those living with HIV/AIDS. U.S. Rep. G.K. Butterfield urged Barton College students to let activism take a backseat to their education. The Democratic 1st Congressional District representative ended a three-day, seven-city tour during the congressional recess Thursday in Wilson. Marcella Medley, president of the Minority Students Association, introduced Butterfield to about 25 other students and faculty members at Hardy Alumni Hall. Commentary: WASHINGTON – U.S. Senator Tom Udall, Congressman Ben Ray Luján and Congresswoman Michelle Lujan Grisham this week joined more than 130 members of Congress in sending a letter to Secretary of Education Betsy DeVos urging her to reverse a recent decision to rescind Obama-era efforts on student loan servicing reforms. The reforms include new consumer protections for borrowers and improvements to the quality of federal loan servicing. During Hurricane Floyd in September 1999, Hurricane Matthew in October 2016 and just plain rain on April 26, 2017 Bynum Farm Road suffered from flooding. Everyone know what devastation Floyd and Matthew brought to the areas of Bynum Farm Road Pinetops NC and Princeville NC along with other areas in Edgecombe County. Just the plain rain caused the folk on Bynum Farm Pinetops NC to evacuate again but no water got into any homes in the area that I am aware of. If folk didn’t see Bynum Farm Road Pinetops NC on the news a couple of days ago you would only think that Princeville NC is the only area in the county that flood. You only hear about Princeville NC because it is the oldest black town incorporated by Slaves. That is all well and fine but it ain’t just about Princeville NC. Bynum Farm Road and Princeville both should not have been any houses in the area. Okay but they are there so ain’t no need to talk about it now. The talk is it has been some major flooding in our life time when it was said during Hurricane Floyd that it would probably be another 500 years or a 100 years. Well Hurricane Matthew was 17 years later. And then the plain rain flood was 6 months later. So we can forget about the predictions of when the next flood may come. What I know is that Trump and the Republicans are running things. What I know is Governor Roy Cooper can ask for anything but has to deal with the Republican majority here in the NC General Assembly. What it looks like to me is FEMA or whoever is continuing to extend the deadline for the Hazardous Mitigation Program making sure folk think about what is going on. I sure know because my dad stayed with me from October til the 2nd week of March. And then a couple of days ago he had to come out again but luckily no water got in anybody’s house. This is Pinetops NC Bynum Farm Road about 12 miles from Princeville NC. What I do know is whatever choices folk make with all of this going on they will have to live with it. The Watch Dog response: Been paying attention for years so this continues to validate the double standards. In the wake of the allegations of sexual assault by Bill Cosby, a plethora of organizations cut ties with him, previously awarded honors and titles were rescinded, Reruns of The Cosby Show and other shows featuring Cosby were pulled from the air, and 25 colleges and universities revoked his honorary degrees. Keep in mind, that most active lawsuits against Cosby are on hold pending the results of his criminal trial slated for on or around June 5, 2017. I bring this all up to compare to Bill O’Reilly, who is now in a very similar situation to Cosby, yet still retains his job at Trump State TV (Fox News). A New York Times investigation published Saturday has revealed payments of about $13 million to five women accusing Bill O’Reilly of sexual harassment, inappropriate behavior, or verbal abuse. How is it that O’Reilly has not suffered the same standard of treatment as Bill Cosby? It is perhaps because “The O’Reilly Factor” draws nearly 4 million viewers nightly? Do You Know Who You Are Working With? Back in the day here in Edgecombe County we talked about having our own black news source. Well I used to do a newsletter on a word processer or whatever it was called and passed them out. Then later in the years I got a laptop and I was able to email the newsletter. Later I was introduced to blogging and that was great. Then came social media such as facebook and wow that was greater. Social media can be good or it can be bad according what one make of it. I try to use it to get good information out to folk and sometimes I have to expose ignance in order to do so. Nope I ain’t mad with anyone and get along with everyone that wants to get along with me. I know how some folk are and some folk don’t know the other side of some folk. I address folk all the time but some folk sit back and say nothing then yes I will expose them on Social Media. I will not be silent when folk are doing things and acting on my behalf and others behalf who are scared as hell to address them in meetings. Don’t get mad with me because I ain’t scared like you. If you hold positions that are about making decisions on behalf of myself and others and you know mess ain’t right, then you are not part of the solution but part of the problem. But then when folk like myself and a few others that speak out say something, then it make us appear as the problem. Oh hell no! I love it when grown folk talk about we can agree to disagree but don’t talk about it on social media. First of all we have not agreed to disagree on anything. When I know you ain’t right and other folk know you ain’t right but say nothing where it need to be said, then that is a major problem. But then get behind closed doors and talk about he/she is a problem but scared to address them, then don’t get mad with me because I ain’t scared. What you do then is show me that you are dangerous because I watch how I work with folk who play both sides. I don’t roll like that. Folk ya’ll better be careful who you work with because them same folk can be hazardous to your health. So glad I know who I am working with and what they are about. Folk I didn’t just start doing this yesterday, it began in the late 80’s. So ask yourself, do you think that if folk were not scared to address folk when they need to be that some things may not make it to social media? Do you not think that in order for the truth to be made known that social media is the place to do it? I know it works for me. I have stated time and time again I will hold you accountable and that you hold me accountable too. But don’t try to hold me accountable because I speak out on trues. Are you scared I am going to call you out next or just what is your motive? I approve of this message and no 2nd needed! Georgia and last week in Kansas had the feel of the first rounds of an epic battle next year for control of the House of Representatives and the direction of national politics as the Trump presidency unfolds. But for all the zeal on the ground, none of it may matter as much as a case heading to the Supreme Court, one that could transform political maps from City Hall to Congress — often to Democrats’ benefit. House Republicans last week rushed through legislation that rewrites a law struck down in court as unconstitutional to merge the state ethics and elections boards into a single panel. The new bill leaves in place an eight-member panel with membership equally divided by the two parties, but the governor would get to make all eight appointments, choosing four from six nominees provided by each chairman of the state Democratic and Republican parties. It would also require the votes of five board members to reach a decision rather than the previous law’s six. County election boards, which currently have three members, would be evenly divided four-member boards.